Update: Apple Watch announced, arriving "early 2015"
Apple has unveiled the Apple Watch at its 2014 iPhone 6 launch event in Cuprtino and revealed the device will be available to buy in early 2015. 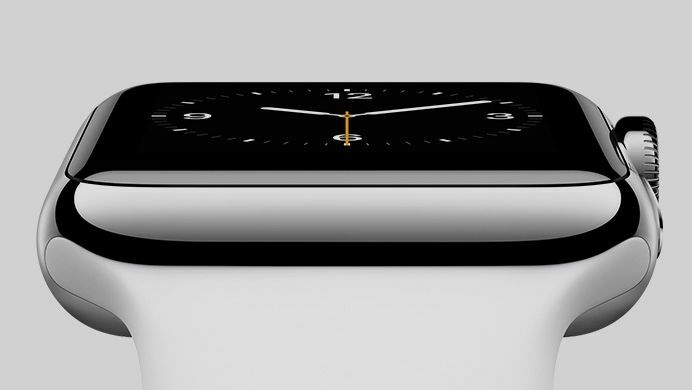 Update: Apple has officially launched the Apple Watch at an exclusive event in Cupertino. The rectangular face will see apps laid out in a honeycomb formation and an innovative digital watch crown on the side used for navigation. We'll be bringing you a proper hands-on review soon, but Apple has given us no more than an "early 2015" hint as to when we'll be able to get hold of the Apple Watch. You can read the full story on Apple's new device here. Original story:iWatch to have 'slightly rectangular' 2.5-inch screen according to new sources. Smartwatch also tipped to start production in July. The watch is pretty much confirmed at this point, with low-level Apple employees referencing the device's design process during talks with the New York Times. Rumours suggest that Apple has hired large numbers of designers and technical experts to help the company reach its goals in creating a wrist-based Apple device. The rumour comes from the Financial Times who also report that there are concerns over whether Apple has the know-how to create such a complex device to their own extreme standards. Supposedly a team of 'about 100 product designers' are working on the iWatch – including managers, marketers and software and hardware engineers who previously worked on the iPhone and iPad. That's according to two people 'familiar with the company's plans', which puts them in a remarkably small category. It's the question on everyone's lips – when will I be able to buy an Apple iWatch. Increasingly, the answer is looking like September. In March, Wedge Partner's Brian Blair has said that he has seen evidence Apple's supply chain in Asia is gearing up for a September launch. Details of his predictions emerged in a research note published by investment website Barrons. That was followed up in May with a report that supply chain partners were beginning to start producing the components that will make up the iWatch itself. Apple employees seemed to suggest a fourth-quarter release for the iWatch, which falls in line with other rumours. In case you were wondering, which we're sure you weren't Apple will almost certainly be calling its Smartwatch the Apple iWatch. This comes after confirmation came in that the tech giant had filed iWatch trademarks in Japan and Russia. What you may not have been expecting however is the news that Apple may not be able to call its product the iWatch in the UK, instead having to come up with a different name after it was revealed that iWatch has already been trademarked in the UK, US and in Europe. Sadly there hasn't been much talk about what Apple's iWatch will cost, but thanks to other companies jumping on the bandwagon we can get a rough idea of what the cost will be. The Sony SmartWatch 2 is set to land in September this year with a price tag of around £150, that means that if Apple applies its usual premium price tag you could be looking at between £180-£220 for your very own iWatch. With rumours circling that Nike could be launching a new Fuelband as well all eyes will be on the company that can offer the best gadget for the cheapest price. The latest rumours say Apple's upcoming timepiece will sport a 'slightly rectangular' 2.5-inch display, and will start production in July 2014. Rumours suggest a sapphire display for the iWatch might be exchanged for a more basic OLED version, thanks to a shortfall in the rare material. Sapphire is expected to be used in the next iteration(s) of the iPhone, which Apple is said to be prioritising in regards to material usage. A recent rumour suggests that Apple will include a UV sensor in the iWatch. According to an investment note released by Barclays analyst Blayne Curtis, Apple's smart watch is likely to come with a UV sensor. His comments follow the announcement by Silicon Labs of the world's first single-chip digital UV index sensors. Another rumour comes courtesy of David Hsieh, an exec at DisplaySearch. Hsieh claims that Apple will be making two iWatch devices, one sized for men and one for women. According to Hsieh the news comes from within Apple. If it turns out to be true it would certainly set the iWatch apart from the competiton who have been looking to find a universal solution for sizing. A further two informers claiming to be au fait with Apple's various super-plans say it is experimenting with a 'wristwatch-like device made of curved glass', operating on iOS. The NYT notes Corning has developed bendable glass last year called Willow Glass which could be used to wrap around something wrist, and cites Forrester's claim that “Apple's certainly made a lot of hiring in that area”. There are also claims Apple is in discussions with Chinese manufacturer Foxconn, which makes a large number of iPhone and iPad parts, about producing an iWatch. Foxconn are apparently working to make more power-efficient displays and stripping down chips, aimed at multiple Foxconn customers. This Wall Street Journal report also claims Apple has hired employees with backgrounds in sensors and related tecehnologies. While many have dismissed the idea of a Apple iWatch in the past, some are coming around to the idea in think pieces. The Cult of Mac notes that recently Siri and iCloud has become massively important to Apple – and that these two technologies actually lend themselves very well to a wristwatch strategy. It also points out that it would be particularly well suited as a remote control to any TV that may be being worked on. The Apple iTV is an entire area of speculation in itself, which we've collated and summarised for you here. It has also been pointed out that an iWatch wouldn't be such a dramatic new area for Apple, since the square iPod Nano with watchstraps can act as, well, pretty much a watch with knobs on. A Blog To Watch also concurs that Siri integration will be key. There is some reason to belive the Apple iWatch might not be just around the corner, however. There are suggestions it could be three years off - Corning says that's at least as long as it will take companies to start rolling out flexible displays, which the iWatch is supposed to feature. Cornign has made the glass and is making “a lot of effort” to teach “very big name” customers how to use it – but the firm estimates we're at least three years off before anyone will produce proper consumer electronics with them. Could one of those big names be Apple? There's no way to be sure, but certainly it doesn't seem too far fetched. There are reams of speculation on precisely what tech the device would have under the hood, which at this point may seem like a rumour bridge too far – but certainly one thing that would seem obvious is some form of better battery performance, since you wouldn't want to take a watch off and charge it twice a day like can be required for a smartphone. On this point, some have highlighted a patent Apple owns for wireless charging. Recent reports suggest that the former Chief Executive of fashion house Yves Saint Laurent, Paul Deneve had been hired by Apple to work on the design of the Apple iWatch. Deneve denies any involvement in the iWatch project but has said he is working with Apple on a number of 'special projects' suggesting that Apple could indeed be working on the finishing touches of a new product category. While early possibilities led us to believe an iWatch would be effectively an iPod Nano on a strap, the latest developments are much more intriguing. According to a patent application unearthed by AppleInsider, Cupertino has been investigating the possibility of a wraparound design similar to the slap bracelets of the early 1990s. According to the patent, the iWatch could be made of a flexible screen that wraps entirely around the user's wrist and utilises solar power and kinetic energy to keep the battery topped up. A couple of interesting mockups have hit the web, but unfortunately there wasn't much to be gleaned from the handdrawn sketches submitted as part of the patent application. What would you like to see of an Apple iWatch? Let us know on the T3 Facebook page.